Unfortunately my children had high fevers, croup, and pneumonia for the last two weeks. It broke my heart to see my babies that sick. I did everything in my power to make them feel better, while also spending several days at the doctor’s office and getting chest x-rays. My poor baby girl barely made it out to trick or treat because she felt so miserable. They both still have lingering coughs, but I am so glad they are feeling better. While I was waiting for my son’s prescription, I picked up a Good Housekeeping magazine and was flipping through pages when I came across a recipe for a Roasted Pepper and Egg breakfast that sounded super good and healthy. I put my own twist on it and I was really happy with how it turned out. I am a huge fan of breakfast burritos, but loved this idea of filling ingredients in a roasted pepper instead of a tortilla. The recipe in the magazine used a roasted red pepper from a jar, but I found a good way to roast peppers on allrecipes.com and it worked perfectly. I will definitely be making this meal again! 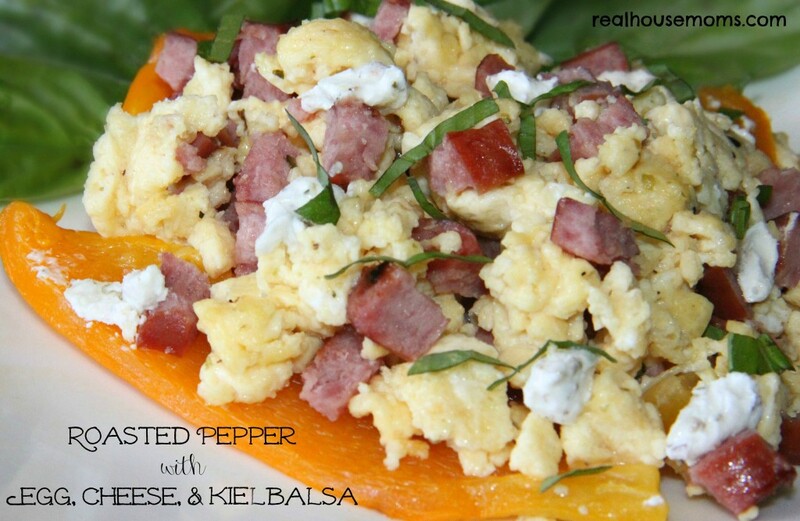 Roasted Pepper with Egg, Cheese, and Kielbalsa is packed with protein and fills you up for hours! You can use any breakfast meat you choose, but I had turkey kielbalsa and it was a great addition to the filling! I also enjoyed using a garlic and herb goat cheese for a little extra flavor! I received fresh basil from our CSA order and used little snips of it on top! This breakfast has an amazing combination of flavors! Roasted Pepper filled with egg, meat, and goat cheese, topped with basil, is a delicious and healthy breakfast that will keep you full for hours! We shared this post at: What’s Cooking, Love?